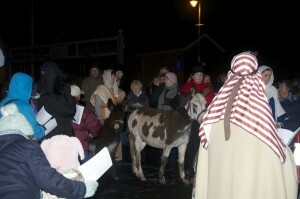 There is some debate as to the origin of the village name. ‘Llan’ is the Celtic name for enclosure or church settlement and ‘Darog’ the name of a high ranking official to Hywel Dda or he could have been a holy man or local Celtic chief, thus – Llanddarog. 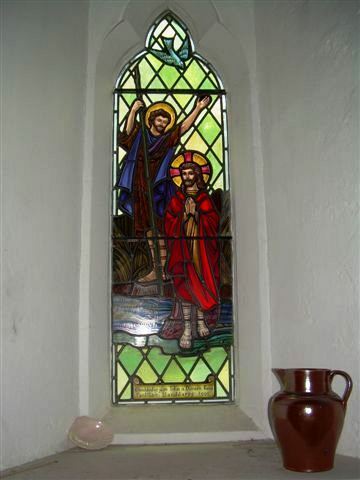 The Church is dedicate to St Twrog, a Celtic saint who was apparently more active in north Wales. The earliest register dates from 1736. It is believed to have been built in 1854 on the site of a previous wooden building to a design by R K Pensan (1816-1886). In the mid 19th century Kyrke Pensan was the Carmarthenshire County Surveyor. The spire, topped by a weathercock, is a local landmark as it can be seen for miles, at 150 feet tall. Iolo Morganwg came to Llanddarog in 1796 and described it as a ‘village with a large but rudely built church, that has a school in it, a common thing in Wales”. This could have been the wooden building later destroyed by fire. The Church has benefited from many donations over the years that have resulted in new stained glass windows, candle holder, pipe organ, brass lectern. One proud possession is a silver communion cup, made by a Carmarthen silversmith and believed to be a gift from Elizabeth I in thanksgiving to those parishes that had given military help to her grandfather Henry VII, to win the Battle of Boswroth in 1485. It bears the inscription ‘Poculum ecclesie de Llanddaarog’. Llanddarog Parish had given considerable help to Sir Rhys Ap Thomas, who placed the crown on Henry’s head on the field, thus making him the first Tudor monarch. Passing through the porch into the Church the font is on the left as you enter. The candle in its holder represents new life. The Baptistry window depicts John the Baptist baptising Jesus. 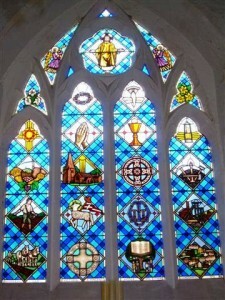 High above the font, the west window depicts Llanddarog life. 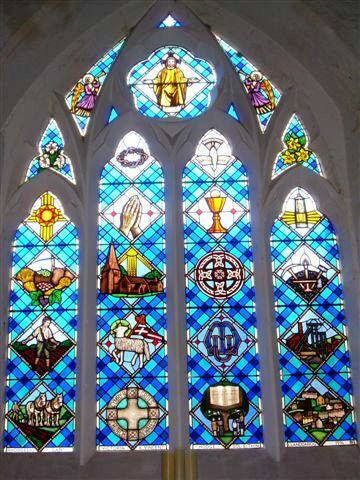 The extreme right hand lancet window shows the past importance of the mining industry to the village. 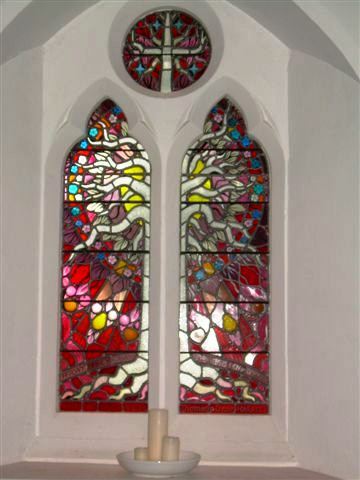 The centre lancet windows show the living Church with its spiritual influence as well as the many facts of its work. Continuing along the back of the church a door leads into the room at the base of the spire and the 30 steps up to the bell tower. The spire holds one bell, dated 1856 which was cast in London. Turning down the side aisle, the incumbent board states that the earliest incumbents were curates (starting in 1720) with the first vicar listed in 1873. The Chancel holds a processional cross and the Mothers’ Union Banner. 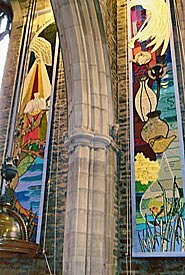 Above the altar is the resurrection window, the Last Supper window and another small window depicting Psalm 150. A door leads into the vestry where the incumbent dons the vestments before conducting the services. Records of baptisms and funerals are kept here and several interesting photographs are displayed. The pipe organ was installed in 1954 and the Brass lectern in the form of an eagle taking the word of God to the world (represented by the orb in his talons) is on the right as you leave the Chancel. 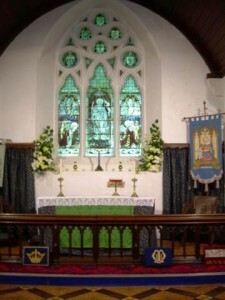 The window on the left near the pulpit represents Christ the Shepherd and the next window shows the ‘Tree of Life’. The Puxley family were the local land owners, buying the estate in 1825. They were the only ones to sit in this part of the Church. Supporters of the Temperance Society, Girls’ Friendly and patrons of Llanddarog Church, they came from Dunboy Castle, County Cork. The Puxley vaults beneath the aisle are entered from outside the Church. The Puxley Chapel has an old cast iron coal stove on the right as you pass through the wooden screen, which heated this chapel in the winter. The first window on the left is from a portrait of Mrs Catherine Puxley (the last of the family to live in Llethr Llestri, the family home), at 18 years of age and depicts St Catherine holding the wheel! 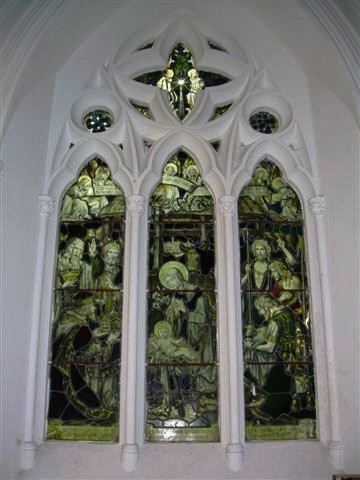 The middle window depicts St Columba, an Irish Saint. The third to the left of the window is of St John the Evangelis, the scroll having words from John 1 v 1. The nativity window above the alter is known as the grey window (from the French grisaille meaning colourless), with a start at the top shining brightly in the morning sun, which is very evocative at the early morning Christmas mass. There is a memorial stone to Edward Vaughan (1705-1736) of Llethr Llestri, the last of the Vaughan line to own Llethr Llestri. He was the great, great grandson of Hugh Vaughan (died 1613), the first of the Vaughan line at Llethr Llestri. 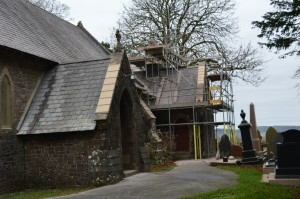 The Puxley Chapel is used from some weekday services, the Clwb Iau and a robing vestry for the choir. It is also where after a marriage ceremony the bridge and groom retire to sign the register.